RF Sub-1GHz module reference manual. TMP101 temperature sensor from Texas Instrument. AP1603 step-up voltage regulator, 0.9V minimal voltage input. Micro-SD card on the standalone version. 15 GPIO, including 2 ADC inputs, 3 PWM outputs, I2C, SPI and SWD access, using 2.54mm pins for easy prototyping. 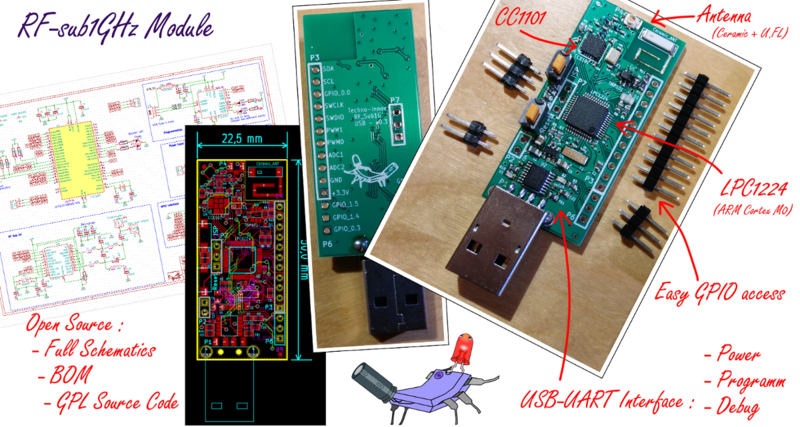 Programming of the UEXT and Standalone versions requires a USB-to-UART adapter (3.3V). All three versions may be operated using a battery or any power supply between 0.9 and 4.2V providing enough current (required current not yet tested). Note : the heigth (15mm) depends on the headers you choose to mount and the selected side for mounting them. The indicated heigth is the worst case, with headers on both sides. Height for standalone module with no header is 7mm. The Sub-1GHz RF module is a radio module for sub 1GHz frequencies (315/433MHz and 868/915MHz). This module is based upon the GPIO-Demo module (or LPC1224-BO) and adds an RF transceiver (CC1101 from Texas Instrument), an oscilator for the internal RTC, and a “Step-up” (step-up voltage regulator) for battery operation. Standalone for all the other uses (create you own IOT devices or drive any part of your home). The software is available in the modules project in our git repository. The code from the sample apps (under apps/rf_sub1G/) makes it easy to start using the module, and will be completed with more complex examples, including specific configurations of the RF transceiver, use of encrypted communication, and power handling, along with the support of existing protocols. Sources for the electronic part (schematics and routing) are available in this directory (KiCad). Get the three archives (.tar.bz2) (The schematics are also available in the technical documentation of the module). The technical documentation for the USB version is available. It includes all technical information about the hardware, the software, the schematics, and the BOM. UEXT and standalone versions are very close to the USB version, their documentation will be written in a near future. Easy access to 34 GPIO, including 6 ADC inputs and access to UART0, UART1, I²C and SPI using 2.54mm pins for easy prototyping, plus 5V, 3.3V and ground from USB on dedicated pins for use without external supply. 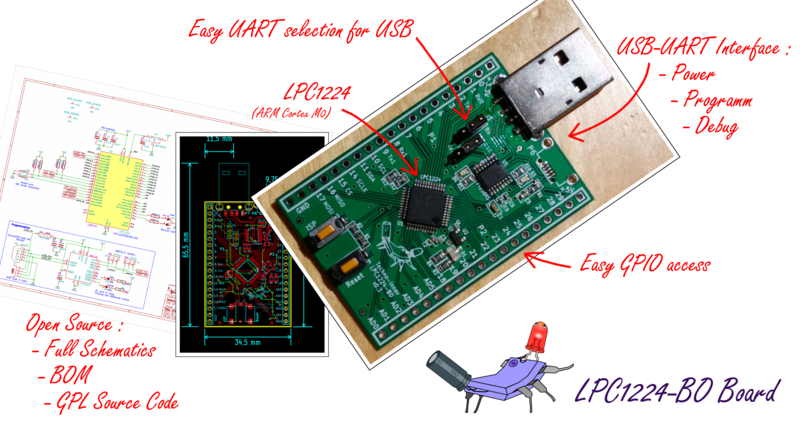 The LPC1224-BreakOut board (or LPC1224-BO) is a simplified version of the GPIO Demo module, using a different form factor for easier use with rapid prototyping boards. This board is not specificaly designed for the DomoTab project, but rather as an autonomous development platform for NXP’s LPC1224 micro-controller. This development board has all the development specific features from the GPIO Demo module: a FTDI FT230X USB/Serial interface which allows you to power and reprogram the module without cables, cards or power supplies (with choice between micro USB or typa A connector), a two tone LED, two buttons for micro-controller Reset and access to ISP boot mode, and of course access to 34 GPIO (including 6 ADC inputs) on 2.54mm threaded pins. They are spaced conveniently for use on a test plate and have access to 3.3V and 5V power. Another complete USB key sized development platform! The main differences (appart from the form factor) are the removal of the UEXT connector and the I²C components (EEPROM and temperature sensor). This manual includes all technical information about the hardware, some help about the software.